Making homemade strawberry jam has never been easier, only requires 3 ingredients, and no sugar needed. 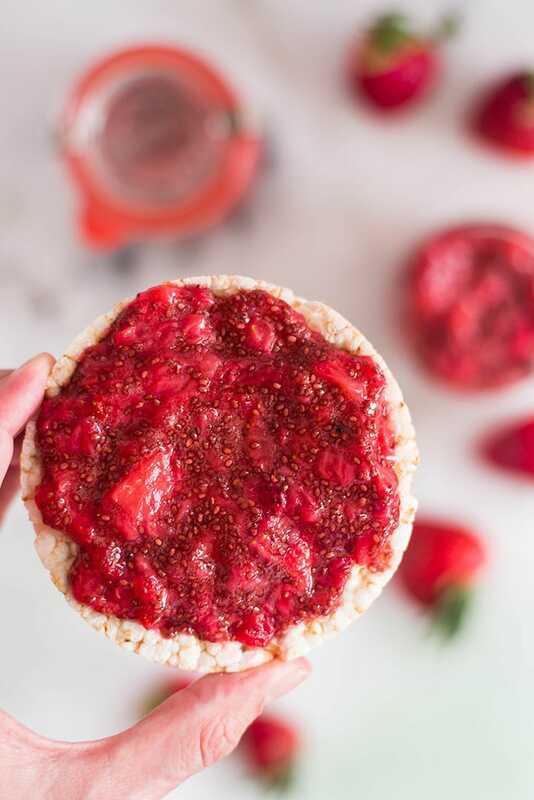 You will not believe how easy it is to make strawberry chia jam for a healthy jam option! What was your favorite school lunch when you were a kid? Mine was a PB&J sandwich! Nothing beats a classic, am I right? Heck — I still enjoy a PB&J almost weekly. Sweet and savory at the same time, soft with just a little bit of crunch, ugh, I’m getting hungry already! Bet you thought you couldn’t enjoy this old fave in a clean eating lifestyle. 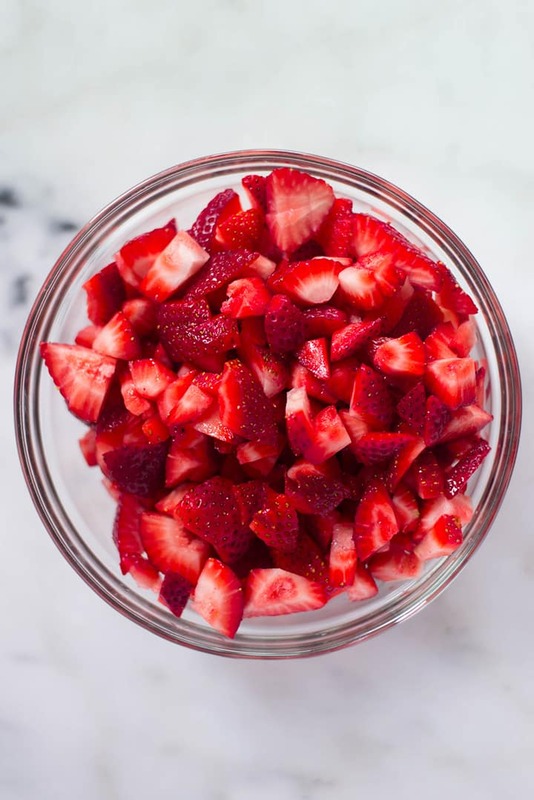 Use a thick slice of whole wheat bread or even a brown rice cake, layered with natural peanut butter and a healthy dollop of this homemade strawberry jam. All the goodness. Problem with most jams out there — even the healthier ones at the store — is the insane amount of sugar that gets added to the jam. I mean…WHY? There’s no need for all that added sugar. I mean, we’re talking about sweet fruit already, am I right? Let’s bring back those happy, carefree days without a trace of guilt. It’s all about making healthier choices! Ever since I’ve made my Strawberry Chia Jam for the first time, not only can I not stop eating PB&Js, but I keep adding the jam into everything! Every dessert is better with a spoonful of this fruity deliciousness. 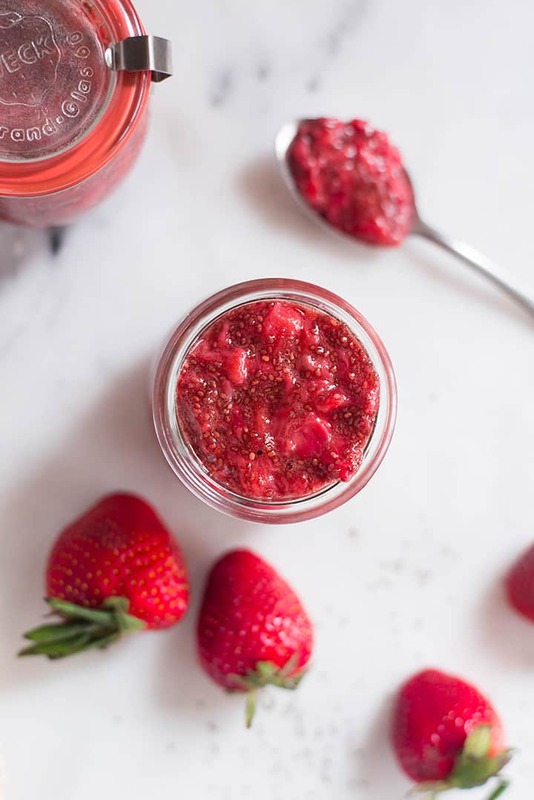 This Strawberry Chia Jam is just perfect for these summer days and so easy to make, seriously. We’ll be skipping the unnecessary sugar and using chia seeds to thicken the jam and just a touch raw honey or pure maple syrup to make it perfect! 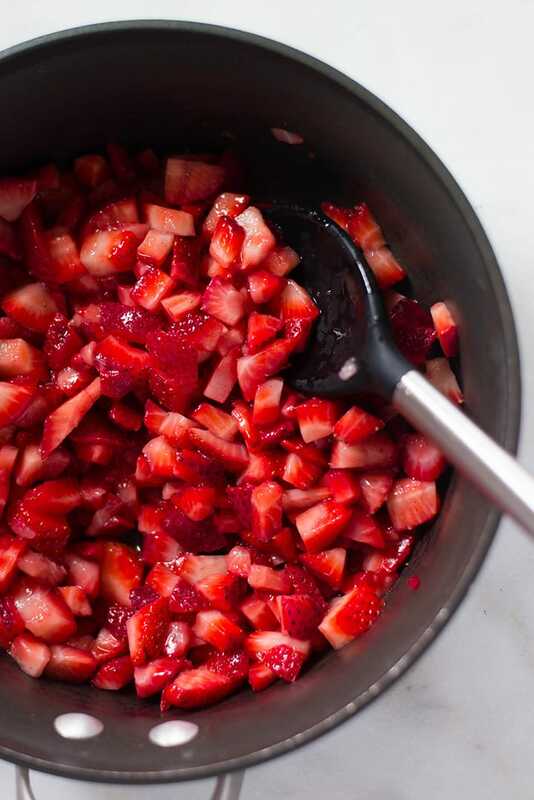 Add the strawberries to a saucepan and set over medium heat. 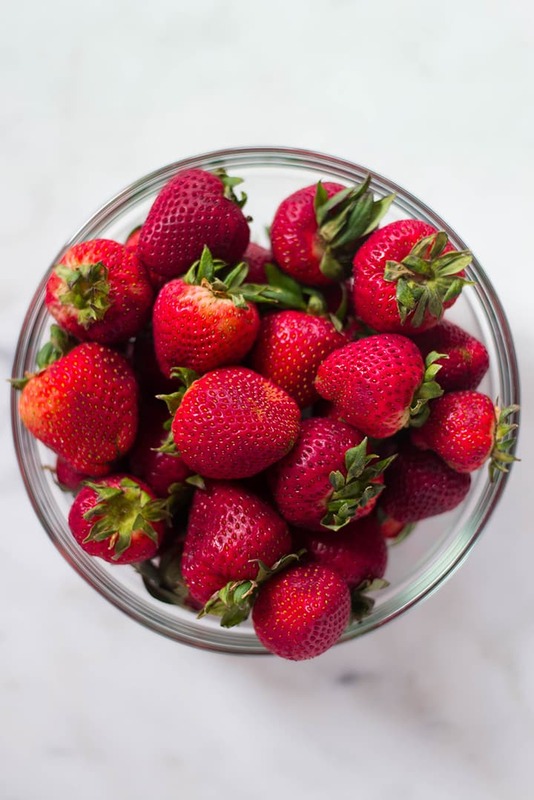 Cook until the strawberries break down and become liquidly, about 5 to 10 minutes. Mash the fruit with the back of a spatula or a potato masher. You can make it as smooth or as lumpy as you’d like here for the texture of the jam. Remove the pan from the heat, and stir in the honey. Taste, and add more honey, as needed, for additional sweetness. If vegan, use pure maple syrup instead of raw honey. Add the chia seeds, and stir to combine. Let stand 5-10 minutes, or until thickened. 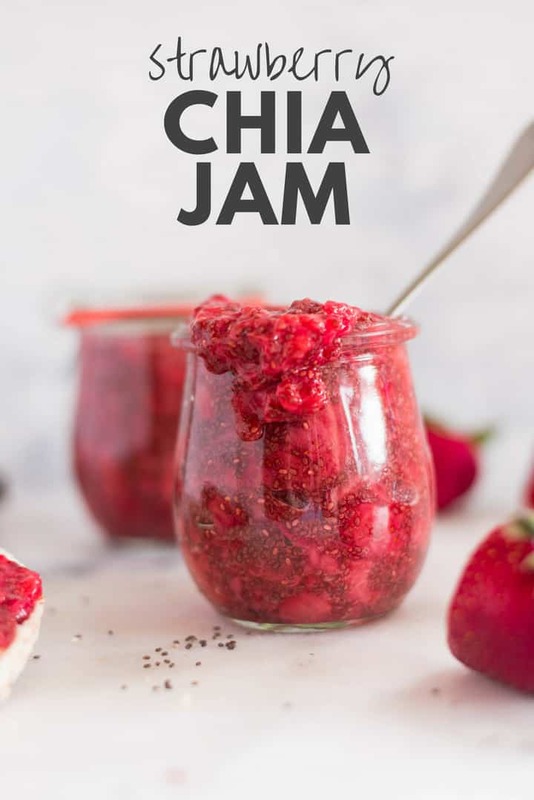 The jam will continue to thicken, especially once refrigerated, but if you’d like a thicker consistency, particularly with very high-liquid fruits, you can stir in more chia seeds 1 tablespoon at a time. Once the jam has cooled to room temperature, transfer it to a jar or sealable mason jar. I prefer to make homemade jam with fresh fruit, but when in need, frozen works, too. Once you’ve got your fruit, all you need to do is chop it up and cook it to break it down. Then, use a potato masher or a spoon to break down the fruit into small pieces. The cooking time depends on the kind of fruit you choose to make the jam. Some fruits take longer to break down and become syrupy. Typically, though, it shouldn’t take more than 8-10 minutes over medium high heat in a sauce pan to cook down the fresh fruit. Then, just remove it from the heat, add in the chia seeds and any sweetener, and let it set. No more cooking required! This is my favorite thing about making homemade chia jam: no need to load it with tons of sugar! In fact, you don’t even need to add any sugar at all, as the fruit contains fructose which is naturally sweet. If your fruit just isn’t quite sweet enough once you taste it, you can sweeten it some with either raw honey or pure maple syrup (this also keeps it vegan). The jam will be sweet and delicious and without the unnecessary calories and processed sugar! This chia jam will store in the fridge for up to 2 weeks, if stored in an air-tight container. I use these adorbs glass jars or mason jars for great jam jar options. The jam will thicken further and become more set once it’s completely chilled. The jam can also be frozen for up to 3 months — just thaw in the fridge before using. 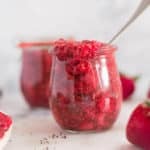 Want to make a healthy version of your favorite berry jam that’s low carb and still deliciously thick and spreadable? Skip the sugar (and the pectin) and add in chia seeds! 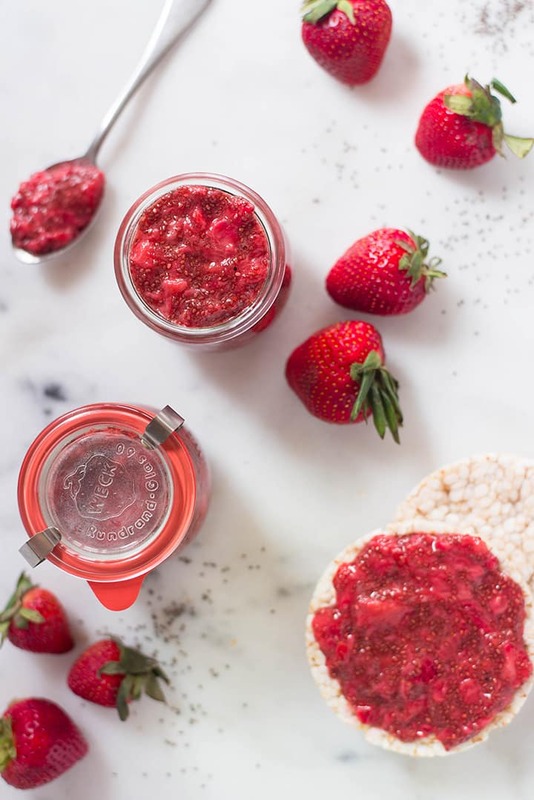 The gelling power of chia seeds will turn your mashed fruit into a delicious spreadable jam in a matter of minutes. Chia seeds are rich in fiber, omega-3 and protein — a powerful combo which makes them a real energy-booster and a perfect healthy option to add into your homemade chia jam recipe. Okay, be right back — gonna be making ALL the jam. Mash the fruit with the back of a spatula or a potato masher. You can make it as smooth or as lumpy as you'd like here for the texture of the jam. Let stand 5-10 minutes, or until thickened. 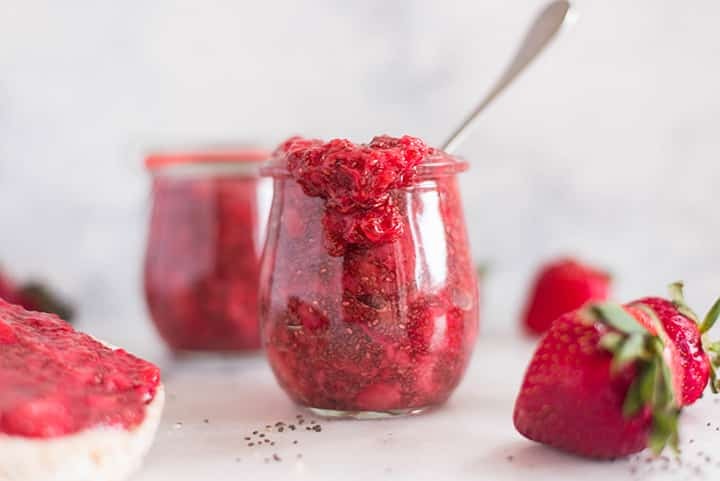 The jam will continue to thicken, especially once refrigerated, but if you'd like a thicker consistency, particularly with very high-liquid fruits, you can stir in more chia seeds 1 tablespoon at a time. This chia jam will store in the fridge for up to 2 weeks, if stored in an air-tight container. The jam will thicken further and become more set once it's completely chilled. The jam can also be frozen for up to 3 months -- just thaw in the fridge before using. 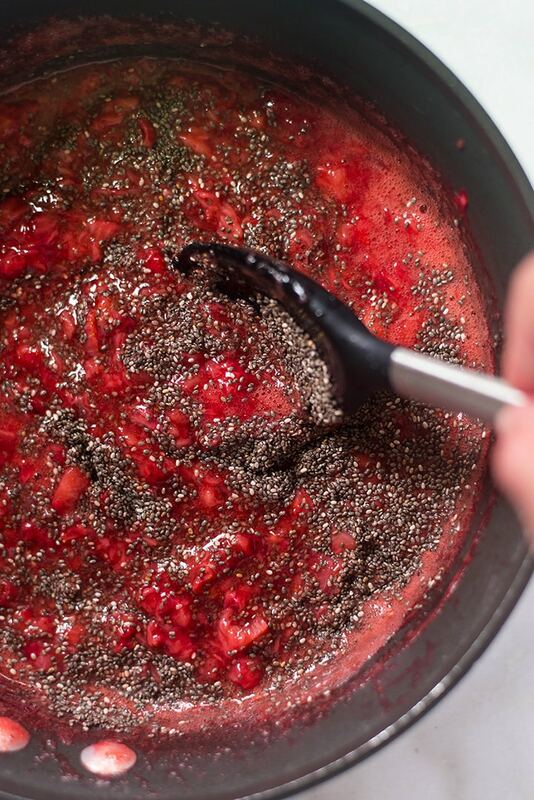 Hi … When making Chia Strawberry jam do I need to ground the Chia seeds. I tried this for the first time last weekend and I am so impressed at how easy and yummy it is. I had to share it with my friends at Wehl. Thanks so much! Lacey the recipe making idea is very cool for the children as well as adults. The main thing I liked the recipe for its quick and healthy ingredients like strawberries, honey, chia seeds. I want to thank you from the bottom of my heart for sharing the information with us. Excellent! waiting for your new post-Lacey.